I'm back again with another look into the world of The Corn People, Pittsburgh's synth jammers who have done an album each month of 2018. Last time, I reviewed the treasure trove of drive-in horror that is The (Candy) Corn People, an album that showed big steps towards a greater identity for these vegetable humanoids. That walk into the edge of the dark continues on Novembers Revenge of the Stalkers. Revenge of the Stalkers has done away with the previous template for Corn People cover art and replaced it with something that looks like a B-movie poster and some very limited coloration. I don't love this. Though the standard texture and cheap designs could be tiresome, sometimes they worked great when used appropriately. It was almost a welcome nod of camp and cheese. Here we have the camp and cheese in a far too limited design. 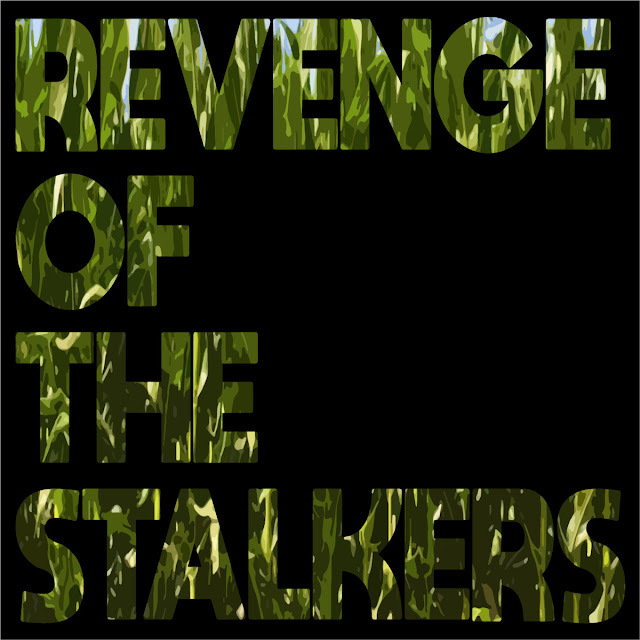 Revenge of the Stalkers by The Corn People "Pesticide" starts the album as a short piece with an Art of Noise-esque robotic clapping effect and a deep, cheap organ. Then it's on to the title track, another spirited foray into some strange aeons. Unlike many of the other Corn People tracks, "Revenge of the Stalkers" uses a minimal and repetitive drum sound that augments the rest of the wild synth trips more than just keeping the beat. After a psychedelic period, there is "Growth", another short piece akin to the interludes on The (Candy) Corn People, this one like a rocket into space, a rising tone that reaches peak magnitude as the stalk bursts clear into the air perhaps for a giant slayer to climb. "Invasive Species" ends the first side with vocoder, buzzing synth waves, and hollow metallic percussion. Order has left the land. Side two, so to speak, starts with the pulsing and aggressive "Where Are the Corn People?" that develops into somewhat of an ambient, industrial dance song. The bass sounds like a horid creature gulping some strange fluid. "A Farmer's Worst Nightmare" returns to the zanier Corn People sound with carnival melodies jumping up and down as synths float around like many small bees. "Field Reclamation" starts another industrial attack. This one features solid drone blocks like the sound of small motors with a boxy beat. Instead of going into solos, the song breaks apart into minimal backing combined with noisy notes. I really like the rhythm here. "Chop Off the Ol Stock" closes out Revenge of the Stalkers with a light melody enhanced with an air of danger. And that, as they say, is that. Revenge of the Stalkers was an interesting progression from the dark interludes on The (Candy) Corn People into aggressive noise combined with the previous light tones of the older albums on a few tracks. It's interesting to see the two separate and combined here, and I really like the more brisk structure of these songs. The album is only around 16 minutes in total, but it is just enough to get it almost entirely right. Next time, I'll move on to the final album by The Corn People for 2018. Revenge of the Stalkers receives a Good.